Joyce Case, Historical Romance -- Welcome! Welcome to Joyce Case’s historical fiction! After many exciting careers, Joyce decided to pursue her childhood dream of writing a novel. Runaway was the first book to realize this dream. Stay the Course, Strength and Honor and Hold the Line continue telling the story of her bold, daring heroine during the tumultuous era of the pursuit of American independence. Click any title above to read more about these thrilling tales of passion and intrigue set upon the panorama of our nation’s birth. Click here to learn more about Joyce Case. Click here to learn more about Kathy Lynn Fields-Reeves, the amazing force behind the new cover art for the series. A headstrong vivacious temptress in need. . .
A personal scout for Colonel George Washington hopelessly in love. . . It was 1754 and the French controlled the Ohio River Valley securing an alliance with the Indian six nations. The British are planning to move in and take over touching off the French and Indian War. Sashsa Nicole Lorraine Dupris never expected to be right in the middle of the conflict. She was enjoying her status as the most available debutante of Montreal but was forced to run away from all she loved to daring adventures beyond her imagination. Rich by her birth right, she becomes involved and befriends many notable and famous people of her time. Colton Tyler Gray, a Major in the Virginia Militia as personal scout to Colonel George Washington never expected to fall madly in love with a head strong, vivacious temptress who spurs his proposals. Sashsa is determined not to relinquish her hard earned independence. Destiny brings the two together to hunt for the persons bent on revenge. Only Colton can unlock the tenderness and hidden passion in Sashsa, but it is not easy. He vows she will be his. Once together, they build a dynasty that will live on in history. In Runaway, Joyce Case sweeps you into a glorious tale of passion set in a tumultous epic in our nation’s history. In the midst of the brutal French and Indian war, a newly married soldier and his beautiful wife must build their romance and a dynasty amid an uncertain future. It is 1755, and the French, accompanied by their fierce Huron comrades, are wreaking havoc along the shores of the Ohio River Valley, torching and destroying everyone and everything along their murderous path. As Colton Gray, a major in the Virginia militia and personal scout to Colonel George Washington bravely battles the French and their Indian allies, his new wife, Sashsa, pines for the man of her dreams. Sashsa, a former debutante in Montreal who was forced to run away from all she loved to avoid an arranged marriage, never expected to fall in love with a strong-willed soldier—let alone marry him. Haunted nightly by passionate dreams of his soul mate, Colton attempts to concentrate on the battles ahead without any idea that Sashsa has a plan of her own. Driven by her intuition that Colton is in trouble, Sashsa risks everything and heads into the battlefield with their young son to defend him. When they are finally reunited, neither is prepared for the danger they will face or the choices they must make in order to protect their happiness—and their hearts. and a dynasty amid an uncertain future. In this continuing romantic saga, a tenacious temptress and the man who loves her must stay the course in the midst of a brutal war and sacrifice everything to build a dynasty that will survive the ages of history. It is 1775, and the English, accompanied by their fierce Hessian comrades, are invading the colonies, demanding loyalty to King George III. In the midst of this rich chapter in American history, we find one of the most unique, emotional, engrossing stories you will ever read! An intriguing page-turner that will immerse you in a world of romance steeped with history. 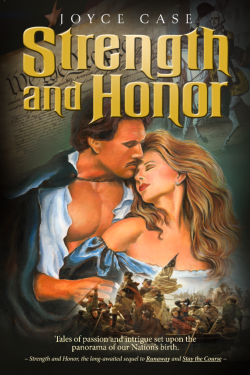 Strength and Honor continues the tale of a headstrong, vivacious temptress and the man who is deeply in love with her, a personal scout to the one and only General George Washington. In spite of its historical underpinnings, Strength and Honor is a fresh look at romance, written with flair, a vivid and unforgettable story set against the backdrop of our very roots. This book will take you back to the days of George Washington, Ben Franklin, Thomas Jefferson, and the rest of our founding fathers. In this sensational tale of passion and an undeniable love that cannot be broken, Sashsa Nicole Lorraine Dupris Gray and Colonel Colton Tyler Gray continue their fight for independence alongside the Commander-in-Chief of the Continental Army, General George Washington. Danger lurks behind every shadow as the secret patriots of the spy ring provide vital correspondence to the Spymaster, who, against tremendous odds, manages to stay one step ahead of the pursuing British. Meanwhile, as hordes of English intruders sweep the colonies, Ziva Isabella Dupris Gray fights relentlessly to keep her own independence from Scottish Captain Drake Cameron, who stirs her very soul. Will her consuming passion for him make her surrender her body in one fleeting moment of weakness? Drake seeks Ziva out time and time again, displaying his devotion, only to be met with rejection. Still, no power on earth can force him to relinquish his exquisite treasure, for he knows that only she can unchain the tenderness in his heart. He vows to have her, for only Ziva can be his love, the one to cherish, to desire, and to carry off to uncontrollable passion. Destiny brings the two together among the Rebel Blue Coats, Tory Green, and King George’s hated Red Coats to build yet another dynasty. Will strength and honor prevail for all, or will their passions get the better of them in the heat of battles galore? 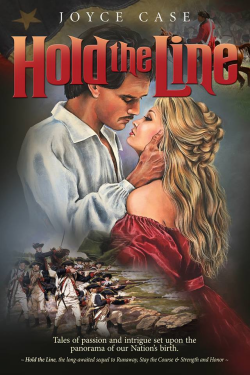 Passionately romantic but wholesome, Hold the Line is fiction that rings with truth, full of believable characters and adventures set against the backdrop of an exciting chapter in real American history. Sashsa, Colton, Ziva, Drake, and even George Washington himself show up in the pages of this series, keenly developed by a brilliant writer into living, breathing, three-dimensional people with whom we can all relate. 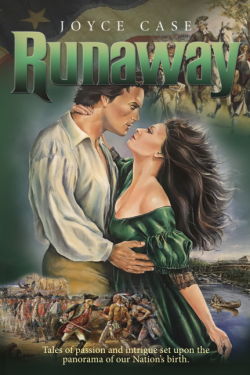 As hordes of English intruders sweep the colonies, Ziva Isabella Dupris Gray fights relentlessly to keep her own independence from Scottish Captain Drake Cameron, the man who stirs her very soul. Will her consuming passion for him make her surrender her precious identity and join him to pursue the ultimate independence of the colonies? In this sensational tale of passion and an undeniable love that cannot be broken, Sashsa Nicole Lorraine Dupris Gray and Colonel Colton Tyler Gray continue their fight for independence alongside the Continental Army Commander-in-Chief General George Washington. Danger lurks behind every shadow as the secret patriots of the spy ring provide vital correspondence to the Spymaster, who, against tremendous odds, manages to stay one step ahead of the pursuing British. Victory rings out, and freedom is had, giving birth to a new nation. The saga lives one to more exciting adventures with a new heroine to make her debut. Hold the Line Coming Soon! After many exciting careers, Joyce decided to pursue her childhood dream of writing a novel. Runaway was her first step in realizing this dream, and more works will follow from this inspired, dedicated writer. She lives with her husband of fifty years, enjoying their two daughters and five grandsons and counting her blessings daily. 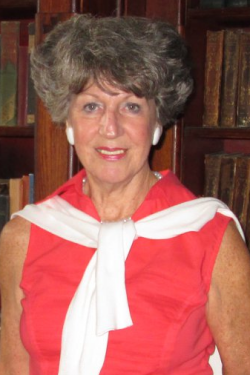 Her background in music, athletics, and sales/marketing have given Joyce a wonderful life full of many interesting experiences and have enabled her to meet a variety of fascinating people along the way, many of whom are an inspiration to the stories she pens. CLICK to visit Joyce’s Amazon author’s page. CLICK to watch a video about Runaway. CLICK to watch a video about Stay the Course. Kathy Lynn Fields-Reeves was born in 1965 and raised in the rural farm community of Cable, Ohio. Having the influence of her father, who was a business owner and farmer, she was raised to notice and appreciate “God’s Country” and everything associated with its natural beauty. From the age of 4, Kathy was introduced the apppreciation of music and was taught to play the piano. Her daily regimen became music and art projects, sometimes exhausting days on single projects to achieve perfect realism. By the age of 10, her passion naturally drifted towards illustrating. Recognizing an inherent visual gift, Kathy’s interest remained focused around art and illustration. She was the youngest student to complete a 2 year, John P. Ludlum Fine Art Course and went on to receive her college degree in Commercial Art from Clark State College in Ohio. 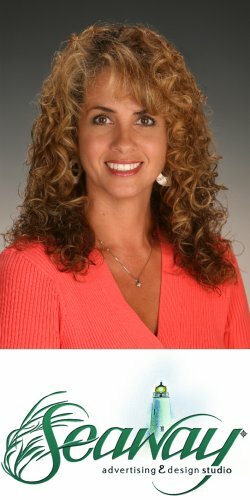 She immediately began her profession career in the fields of desktop, digital pre-press, and full color printing. In the late 1980’s, Kathy was discovered by a decorated national marketing firm and was privileged to learn advertising and marketing on a national level. In the early 1990’s, Ms. Fields-Reeves relocated to North Carolina with her family. She then opened her own upscale advertising and design firm focusing on commercial illustration and digital design. Seaway Advertising and Design Studio continues its success today, supporting local, regional, and national commercial accounts. Kathy has earned numerous awards for her work, ranging from local to international merits, while still pursuing here illustraive desire to achieve artistic works beyond comparison. Today, she resides on a horse farm in North Carolina, illustrating and designing with such detail and remarkable depth far beyond a teachable ability.